CHICAGO, Illinois -- Former President Barack Obama used his first public appearance since leaving office to dole out advice to young people on leadership, managing social media and even marriage. What he didn't do was mention his successor. At a forum Monday for students at the University of Chicago, adjacent to where his presidential library will stand, Obama talked about his formative experiences as a community organizer and as a young politician running for office in Illinois. But for much of the panel event, he listened. "Although there are all kinds of issues that I care about and all kinds of issues that I intend to work on, the single most important thing I can do is to help in any way I can to prepare the next generation of leadership to take up the baton and take their own crack at changing the world," Obama said during event, which was invite-only and streamed live online. He told the hundreds of area students in the audience that his focus after holding the nation's highest office will be civic engagement with young people, and he that he hopes his presidential library, which will stand near the edge of campus, will be part of that mission. 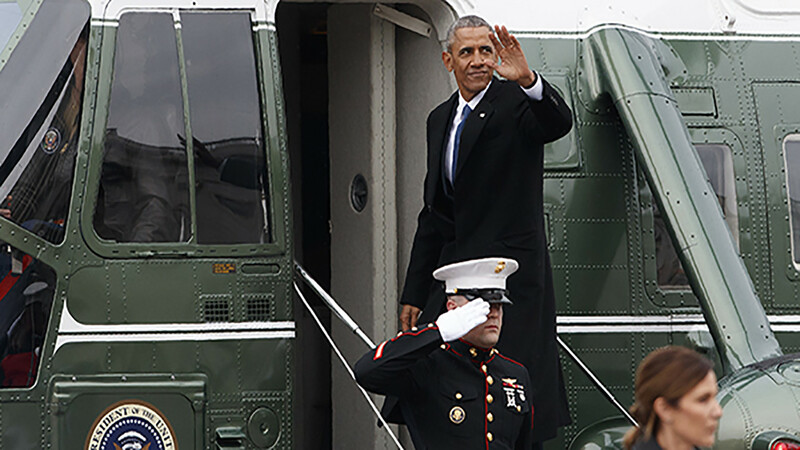 Since delivering his farewell address in his hometown of Chicago in January, Obama has kept a low profile. He met privately Sunday with a group of at risk young men, talking about gang violence and opportunities for jobs. His first public engagement Monday came as President Donald Trump neared his 100-day mark in office. But Obama shied away from addressing specific policies or his own two terms as president. When it came to current events, like immigration, he stuck to generalities. When a college student panelist asked how to conduct a project involving interviewing day laborers, Obama told him to ditch the clipboard. When others asked about being young in the age of social media, Obama advised them to limit photos posted online, including being "more circumspect about your selfies." He also dropped in a marital tidbit, saying it's best to "listen to understand" instead of listening "to respond." "I learned that in marriage," he said to laughs from the audience. "That'll save you a lot of heartache and grief." He encouraged students to talk to people who have opposing viewpoints, asking a college Republican panelist to discuss his campus experiences. Obama said his work as a young organizer, which included meeting with Chicago public housing residents, laid the foundation for his time in office. He said he's been reflecting as he works on a book chronicling his political career. "This community gave me a lot more than I was able to give in return," he said. "This community taught me that everybody has a story to tell that is important."